Every time I have cauliflower I realise how much I love it, but I don't have it often enough. 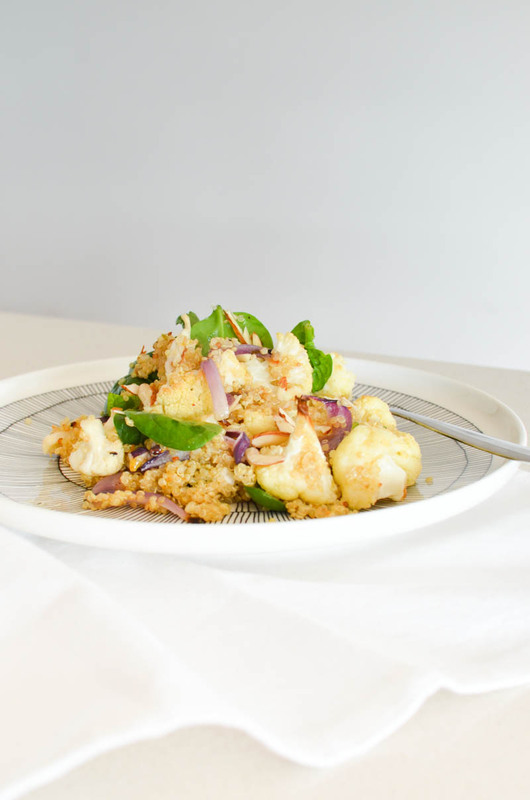 This roasted cauliflower and quinoa salad was perfect for a sunny winter's day. I got the inspiration from this recipe, but since I didn't have most of the ingredients I just used what I happened to have in the fridge. The original recipe sounds amazing though, so I might just give that a go next. 1. Preheat the oven to 200C. Scatter cauliflower and onion on a roasting pan, add olive oil and season with salt and pepper. Roast for 30 minutes or until tender. 2. Rinse quinoa and cook in vegetable stock until tender and fluffy. Add lemon juice and mix with a fork. 3. Combine quinoa with the vegetables and sprinkle with almonds. Serve warm.